As for the foodstuffs, there was one thing on the menu that called my name annoyingly loudly. It was called Breakfast “Naan”-zza, which is fancy bakery-speak for pizza on a piece of naan bread. The menu said this was to be topped with gruyere, sausage, bacon, a farm egg, jalapeno relish and grilled onions. I wanted nothing to do with the onions and ordered thusly. 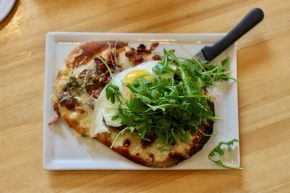 While Claudine heeded my order, they failed to tell me that this naan-zza would come topped with a devious handful of arugula. I don’t know what the hell they were thinking, but you cannot be so damn careless with arugula. Maybe they thought that nearly $13 for a mini pizza with those toppings would be an easier pill to swallow if they added one more ingredient? However, this was subtraction by addition and it’s one thing to throw the mess in a bowl or on the side, but strewn atop my pizza was something that could not be forgiven. 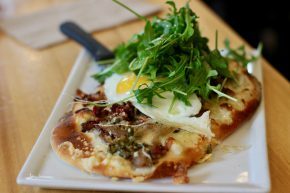 And that’s a real shame, because everything else about the naan-zza was great, including the explosive yolk of the egg. Instead of leaving Claudine singing the praises of the naan-zza, all I was left with were the thoughts of what might have been.